"What’s so special about yoga for climbers? Can’t I just climb more and improve that way?" I was asked this question by Michael, who had seen us during one of our morning yoga sessions on the on the Petzl RocTrip 2014. Perhaps you’re asking yourself the same question? Here you can read how I responded to Michael at the time and what 5 other participants had to say about yoga for climbers. I’ve updated this blog post from 2014 for you to include a startup guide and the 3 most important yoga tips for climbers. Stretch out your right arm and left leg, then pull them both towards you. This dynamic version of Cat-Cow was one of our warmup exercises to loosen up and stretch the back. I take a brief pause. "Perhaps your body will change in a way that allows you to have completely new experiences while climbing. Specifically, this means that you might be able to place your feet differently, be able to move your legs higher, be able to move more smoothly and climb with more body tension," I explain. "Or you’ll notice that your body recovers faster after a day of climbing. Yoga trains your body to recover more quickly. If you practice yoga after climbing, you’ll speed up the recovery process." A metaphor comes to mind here. Yoga for climbers is a bit like lubricating your bike chain. If the bike chain is rusty, your bike moves much slower. And it’s harder to pedal. "What your greatest challenge when climbing? Where could yoga help you?" I ask him. Interestingly, it’s not flexibility as with many other climbers. "My biggest challenge is actually my back. My lower back feels tight sometimes, and I need to climb a few routes until I'm warm," Michael reflects. "I’m actually pretty flexible, but my back sometimes bothers me after climbing." He stretches and turns slightly to the left. "A few exercises after climbing will likely help counterbalance your back. But that’s not enough. Training the muscles that are neglected during climbing on non-climbing days is just as important," I reply. This doesn’t look very spectacular, but actually feels great for the lower back after climbing. And when it comes to doing it consistently? "It’s important to create an experience for yourself that you love so much that you no longer want to go without it." I was interested in how the participants of our morning yoga session experienced the yoga. "What was your experience? What did like in particular?" I ask Jon, Alexander, Marian, Mohamed Ali and Oana. "The exercises for the back feel really good." "I feel really good now. The stretches for the back were great – the forward bends and also the back bends. I already have some experience with yoga as well as with meditation and Pilates," says Jon. "I had a lot of fun during the session. I think it was more physically oriented and really hit the spot." Here’s a short video of the interview. On our YouTube channel, you’ll also find the feedback from the others and one of our 30-minute yoga sessions in English. "The movements have a really balancing effect." Deeply relaxed, Alexander shares after the session: "I found it very nice and really enjoyed it. The combination of movements has a really balancing effect, and I think it’s great that you can combine climbing and yoga in that way and do it as a group." After the yoga session in the morning, Alexander is focused on his route. 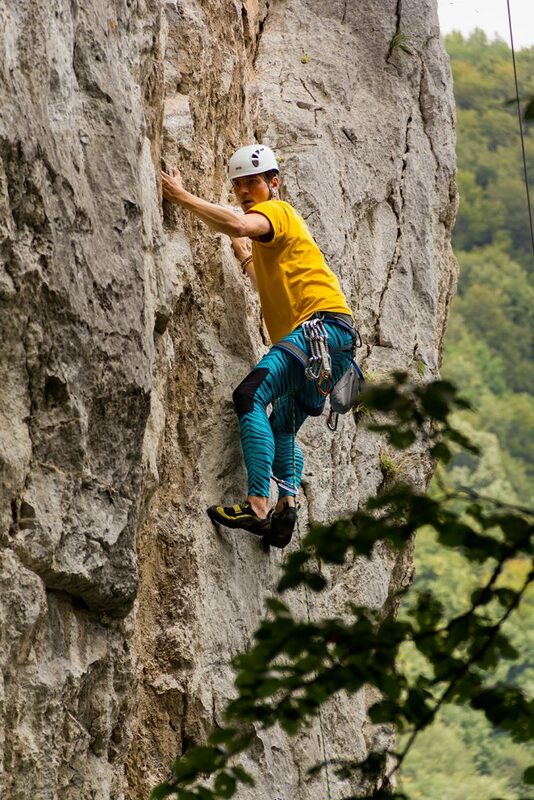 Climbing in Baile Herculane, Romania, was a wonderful experience. Especially because of the climbers on the RocTrip, of course, but also because the routes are beautifully located among waterfalls and forests and are wonderful for climbing. "Yoga for climbers is unique and more than just stretching." "I liked it a lot – it was a unique experience," says Marian, who had never tried yoga before and spontaneously participated in a session. "I normally do stretching exercises myself, but not in such an organized sequence as in a yoga session. As a climber, I thought the combination of exercises was great. It was super relaxing, and you feel really active afterwards." "It feels great, especially after several long days of climbing." "That was my first yoga session," says Mohamed Ali. "I thought it was really great. The exercises weren’t too difficult for me and offered me a good counterbalance, especially for my legs and upper body. After several days of climbing, I definitely start to feel it in my body, and it really helps." "I’m taking the good feeling onto the rock with me." "Yoga in the morning was great," says Oana. "Stretching and warming up before climbing gives you a good feeling that you can take with you all day. I think the back and shoulder exercises are really beneficial for climbers. " "It helps most climbers develop a better awareness of their body and become more flexible. Other climbers find that it helps them build more body tension. It’s different for everyone and depends on the exercises and the intensity of your practice. You’ll only find out what it can do for you personally if you give it a try," I say to Michael in closing. Michael nods and grins. "I’m in! When’s the next session?" His openness and motivation surprised and thrilled me. As with many other things, there are different ways of getting started. Without a Why, there is no How! What pushes me to my limit when climbing? Where could yoga help me? Maybe a stiff back after climbing? 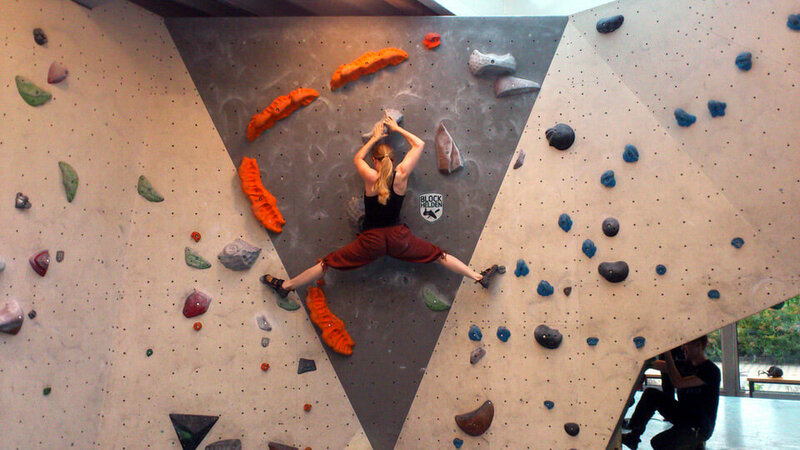 Bouldering can present you with crazy problems that require you to make strange movements. Which of these physical areas could you use help with? Now the important question arises: How do you get there? Find a course near you to build up a yoga foundation. Then (afterwards or at the same time) put together your own yoga practice. This is necessary if you really want to notice a difference. In order to get a step further, create routines in which you practice a certain sequence 3 times per week, for example. First, make the decision to practice yoga consistently for at least 6 weeks. Then register for a course. Buy a yoga mat: Here you can find a yoga mat guide. Set aside time for your yoga routine: When and how long do you want to get down on the mat? Keep it simple. It doesn’t have to be a full hour. Even 20 focused minutes can make a big difference. Climbing more often certainly isn’t a bad idea. But yoga for climbers can help you break negative habits and internalize new stimuli for your body. Your body awareness changes. This is a crucial point when it comes to using your body in a better, more targeted way on the wall. What specifically will change for you depends on your focus. Ask yourself your "Why," then find your "How" and decide to really stick with the new experience for a certain period of time. How about you? What experiences have you made with yoga for climbers or with yoga in general?